Rabbit polyclonal Doublecortin antibody. Validated in WB, IHC, ICC, ICC/IF and tested in Mouse, Rat, Chicken, Cat, Human, Cynomolgus monkey, Quail, Rhesus monkey. Cited in 177 publication(s). Please note: Low dilutions of this antibody can cause high background in IHC. Please use as high a dilution as possible. Optimal working dilutions are batch dependent. Synthetic peptide conjugated to KLH derived from within residues 300 to the C-terminus of Human Doublecortin. 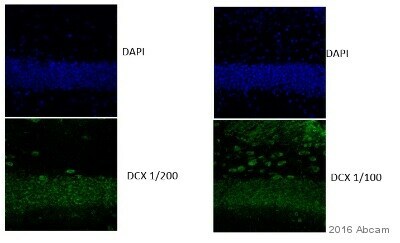 This antibody gave a positive signal in Brain (Mouse) Tissue Lysate - normal tissue, 0 days old ICC-IF: SHSY5Y cells. IHC-P: FFPE Rat brain 6 weeks. Our Abpromise guarantee covers the use of ab18723 in the following tested applications. WB Use a concentration of 1 µg/ml. Detects a band of approximately 45 kDa (predicted molecular weight: 40-45 kDa). IHC-FrFl 1/1000. Please note: Low dilutions of this antibody can cause high background. Please use as high a dilution as possible. Optimal working dilutions are batch dependent. IHC-P Use a concentration of 0.05 - 1 µg/ml. Perform heat mediated antigen retrieval before commencing with IHC staining protocol. ab18723 staining Doublecortin in mouse embryonic 15 day brain tissue sections by Immunohistochemistry (PFA perfusion fixed frozen sections). Tissue samples were fixed by perfusion with paraformaldehyde, permeablized with 0.5% Triton X-100 in PBS, blocked with 10% serum for 1 hour at 25°C and antigen retrieval was by heat mediation in citrate buffer, pH 6. The sample was incubated with primary antibody (1/500 in PBS + 0.1% Triton X-100 + 1% serum) for 16 hours at 25°C. An Alexa Fluor® 594-conjugated donkey anti-rabbit IgG polyclonal (1/700) was used as the secondary antibody. Immunohistochemistry (Frozen sections) - Anti-Doublecortin antibody (ab18723)This image is courtesy of an anonymous abreview. 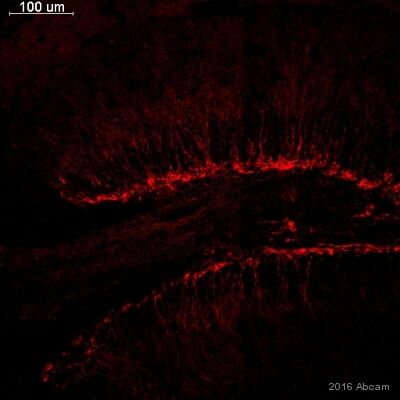 IHC-Fr image of Doublecortin staining in Mouse adult dentate gyrus sections using ab18723(1:100). The sections were fixed in paraformaldehyde and permeabilized using 1x TBST. The sections were then blocked using 10% donkey serum for 1 hour at 25°C. ab18723 was diluted 1:100 and incubated with the sections for 12 hours at 25°C. The secondary antibody used was Donkey anti-rabbit conjugated to Cy3 Dye (1:500). DAPI was used to stain the nuclei. IHC image of ab18723 staining in rat 6 week brain formalin fixed paraffin embedded tissue section, performed on a Leica BondTM system using the standard protocol F. The section was pre-treated using heat mediated antigen retrieval with sodium citrate buffer (pH6) for 20 mins. The section was then incubated with ab18723, 0.1µg/ml, for 15 mins at room temperature and detected using an HRP conjugated compact polymer system. DAB was used as the chromogen. The section was then counterstained with haematoxylin and mounted with DPX. 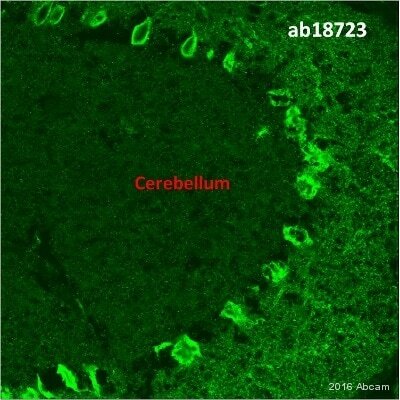 ab18723 staining 6 week rat brain tissue dentate gyrus (DG) by IHC-P using rabbit-specific EXPOSE IHC detection kit (ab80437). Formalin fixed paraffin embedded tissue sections were pre-treated using heat mediated antigen retrieval (using a pressure cooker) with sodium citrate buffer (pH6) for 30 mins. The section was incubated with ab18723, 0.1µg/ml, for 1 hour at room temperature. DAB was used as the chromogen and the section was counterstained with haematoxylin and mounted with DPX. ab18723 at 1/200 staining mouse E18 body T/S spinal cord tissue sections by IHC-P. The tissue was formaldehyde fixed and a heat mediated antigen retireval step was perfomed before incubation with the antibody for 24 hours. A biotinylated goat antibody was used as the secondary. ab18723 stained in SHSY5Y cells. Cells were fixed with 100% methanol (5 min) at room temperature and incubated with PBS containing 10% goat serum, 0.3 M glycine, 1% BSA and 0.1% triton for 1h at room temperature to permeabilise the cells and block non-specific protein-protein interactions. The cells were then incubated with the antibody ab18723 at 5 µg/ml and ab7291 (Mouse monoclonal [DM1A] to alpha Tubulin - Loading Control) at 1/1000 dilution overnight at +4°C. The secondary antibodies were Goat Anti-Mouse IgG H&L (Alexa Fluor® 594) (ab150120) secondary antibody (pseudo-colored red) and Goat Anti-Rabbit IgG H&L (Alexa Fluor® 488) preadsorbed (ab150081) secondary antibody (colored green) used at 1 ug/ml for 1hour at room temperature. 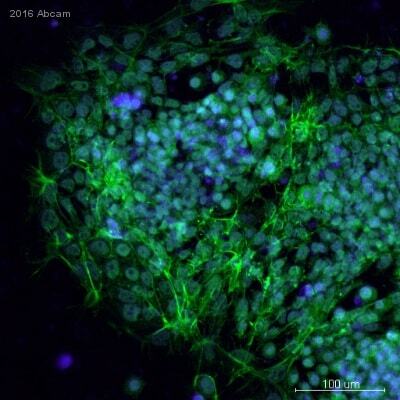 DAPI was used to stain the cell nuclei (colored blue) at a concentration of 1.43µM for 1hour at room temperature. Doublecortin antibody (ab18723; green) labeling cell extensions consistent with dendrite morphology in 4 day old cultures. Preincubation of ab18723 with its immunising peptide (ab19804) quenched immunostaining (see review). Doublecortin expression in the dentate gyrus of a 1 month-old mouse brain. 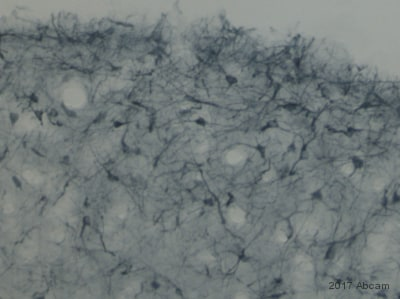 Doublecortin staining using ab18723 (1/500) in the dentate gyrus of a 1 month-old mouse brain. The mouse has been perfused with paraformaldehyde 4% (50ml). After dissection, the brain has been incubated overnight in sucrose 20%, embedded in OCT and cryosectioned (10 µm). No antigen retrieval was used. 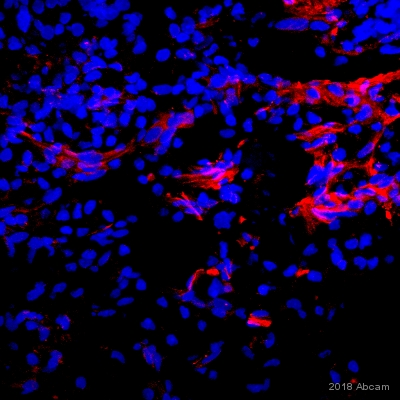 The secondary antibody used was a non-Abcam Goat anti-rabbit Alexa488. 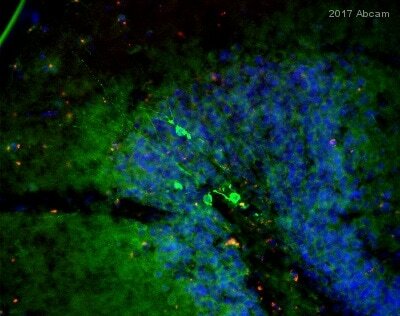 Immunohistochemistical staining (on formaldehyde/PFA-fixed paraffin-embedded sections) of Doublecortin antibody - Neuronal Marker (ab18723) on Quail Tissue sections (E6/7 brain (Saggital section). Antigen retrieval step: Heat mediated. Blocking step: 1% BSA for 10 mins at RT. Primary Antibody ab18723 incubated at 1/400 for 2 hours RT. Secondary Antibody: Biotin conjugated goat anti rabbit Ig (1/300). ab18723 at 1/2000 staining mouse brain svr: progenitor olfactory neurones by IHC-P. The tissue was formaldehyde fixed and a heat mediated antigen retrieval step was performed before incubation with the antibody for 16 hours. 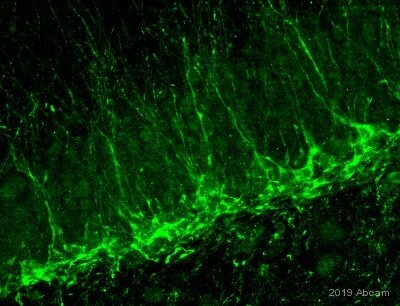 An Alexa-Fluor ® 488 conjugated goat antibody was used as the secondary (green). 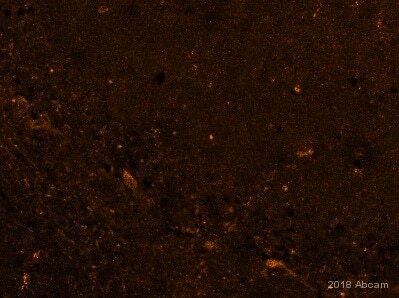 The tissue was also stained for Ki67 (shown in red). The MIP image was derived from Apotome-generated Z-stacks from the greyscale image of each of the channels in the MIP. ab18723 staining Doublecortin in mouse dentate gyrus hippocampal tissue section by Immunohistochemistry (PFA perfusion fixed frozen sections). Tissue samples were incubated with primary antibody 1/1000 for 16 hours at 4°C. An Alexa Fluor®488 conjugated goat polyclonal to rabbit IgG at 1/400 dilution was used as secondary. Publishing research using ab18723? Please let us know so that we can cite the reference in this datasheet.